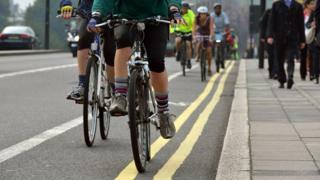 Lord Winston has renewed calls for cyclists to require licences and insurance. The government ruled out the proposal in 2018, saying the cost and complexity would outweigh the benefits. The Labour peer’s concerns were echoed by others in the House of Lords worried about “hoodlums in Lycra”. But Tory peer Lady Barran said only a “small minority” of cyclists, motorists and “smombies”, people on smartphones walking like zombies, caused problems. Lord Winston said: “Most cyclists, of course, are conscientious and law abiding. “But an increasing number are extremely aggressive and avoid [the rules on] one-way streets, pedestrian crossings and red traffic lights – and from time to time they collide with pedestrians. Liberal Democrat Lord Sharkey said the crossing outside the Houses of Parliament was “an accident waiting to happen”, especially at rush hour, because of cyclists. And Labour’s Lord Wills said existing measures to punish poor cycling behaviour were not being used. He cited a Freedom of Information request showing, of the 38 police forces who issue fines to irresponsible cyclists, 30 issued fewer than five last year, and 12 of those issued none. He said: “Does the minister really think there is so little irresponsible cycling on pavements? Lady Barran said the government “wants to insure safety for all road users, including pedestrians and cyclists” but establishing a central register – especially when three million cycles were sold every year – would be too “cumbersome”.